Trade figure from the Big Boy restaurant on South Park Street, Madison, Wisconsin, 1971-1985. In 1932, scientists at Owens-Illinois Glass Company discovered a way to make glass fibers in commercial quantities and began marketing the material as furnace filters and insulation. After World War II, engineers sought new applications and found that, when combined with resins, the fragile glass fibers became tough, flexible, and moldable. From Eames chairs to Corvette bodies to boat hulls, fiberglass-reinforced plastics flourished in the 1950s and made light, durable, vivid advertising sculptures possible. 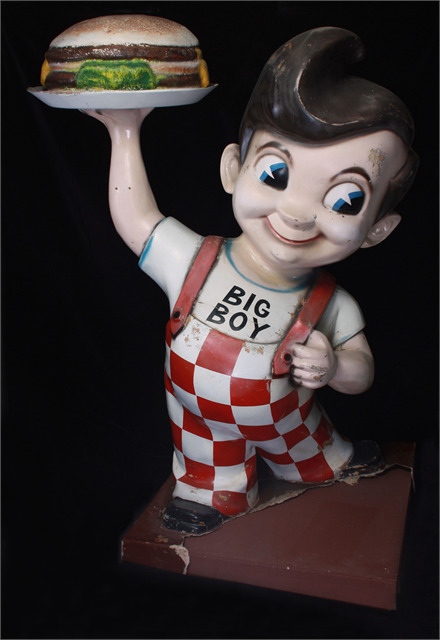 "Big Boy" is one of the most recognized and best-loved symbols of American roadside dining. Developed in California in the 1940s, the larger-than-life-sized character attracted the attention of motorists whizzing by and helped create a unified image for the far-flung franchise chain. With the emerging threat of television in the late 1950s, Milwaukee-based movie theater owner Ben Marcus planned to diversify his business. He met with Bob Wian, inventor of the double-decker hamburger (the "Big Boy") and owner of a growing California restaurant chain. Marcus liked what he saw and bought the regional franchise rights to Big Boy restaurants. Marcus’ first Big Boy opened in Milwaukee, and eventually the Marcus Corporation operated more than 60 Big Boy restaurants (called "Marc's") in Minnesota, Iowa, Illinois, and Wisconsin. Although we can’t be sure that this particular Big Boy figure was made in Wisconsin, many of his brothers were. Fiberglass Animals, Shapes and Trademarks Corporation (F.A.S.T.) of Sparta, Wisconsin and its predecessors have manufactured fiberglass sculptures, including Big Boys, for more than 40 years. Concerned that the rotund burger-boy no longer represented its more diverse, health-conscious menu, the franchise proposed retiring Big Boy in 1985. Although customers overwhelmingly voted to keep him, Big Boy’s victory was short-lived in Wisconsin. Faced with declining revenues from its Big Boy restaurants in the late 1980s, the Marcus Corporation tried reviving the chain by updating menus and décor. Marcus even tried dropping the Big Boy name. When few customers complained about the change, the company phased out the name entirely and closed its last Big Boy restaurant in 1995. While they have been absent from Wisconsin for the past decade, Big Boy restaurants thrive in other parts of the country. In this state he lives on, separate from the business that spawned him, as an icon of advertising art. Promoted through nostalgic dolls, t-shirts, and souvenirs, Big Boy has achieved a secure niche in American popular culture.